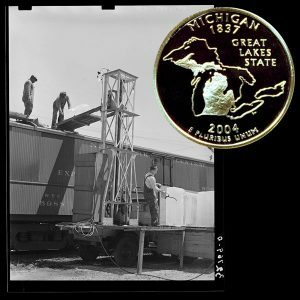 Today, the Michigan State Quarter Coin remembers the first of many patents for the refrigerator car on November 26, 1867. Four hundred and eighty-seven patents on refrigerator cars have been issued by the United States Patent office and probably twice as many applications for patents have been allowed to die neglected. From this it is apparent that the improvement of the equipment for transporting fruit and other perishable food-stuffs has had the serious attention of many capable men. Most of these men have endeavored to make radical, impractical, and complicated changes in the refrigerator car, some installing wonderful machines, many of them having no regard for expense, most of them forgetting the principles which, in our present age at least, restrict to narrow limits the possible changes. Such changes only, are permitted as will improve the car and yet will not greatly advance the cost, nor complicate the handling of the lading or the car itself. In the first place the car must conform as nearly as possible to the size, shape and design of an ordinary freight car. A railroad cannot alter its roadbed, bridges and tunnels to accommodate a new device no matter how praiseworthy. Second, the cheapest, simplest, easiest manipulated, and most practical agency for refrigeration is ice, and hence the car must resemble in general principles an ice box or refrigerator. Third, the devices for carrying the ice must be so placed in the car as to permit the maximum lading space. Fourth, each car must be a unit. A car may be cut out of a train for a dozen reasons, and must necessarily be held at destination until unloaded. Since these principles seem to be essential they should be kept in mind in a survey of the different steps in the development of, the refrigerator car in the United States, because the car used in the United States by most of the important railways, is by general consent considered the best of its kind. There are three general systems which are or have been prominent, one in which the ice is placed in a tank or tanks suspended from the roof/panel the cool air is precipitated upon the contents below in various ways; another in which the ice is placed in one or both ends of the car, and the air within kept in circulation by a fan or other mechanical device; a third, which is now nearly universal, has ice tanks at each end of the car and the air circulation is obtained naturally, because of the relative density of cold air and warm air, and the displacements which occur when one is properly acted upon by the other. A fourth type, which seems to have been eclipsed, admits fresh air from outside the car, cools it, uses and expels it again. This introduction of fresh air from the outside has many drawbacks. Since the air is warm, it not only melts large quantities of ice, but carries countless germs and other deleterious organisms which find nutritious soil on the surface of the perishable goods. In this fourth type was the first American refrigerator car for which a patent was issued to J. B. Sutherland of Detroit, November 26, 1867. This car had ice chests in each end. The air from the outside was admitted at the top, passed down through the ice chamber, and was discharged near the floor into the loading space to reduce the temperature. The car was constructed with double walls, roof and floor for insulation. The air inlets at one end operated as outlets, depending on the moving direction of the car. What might be called the first successful refrigerator car was patented by Wm. Davis, also of Detroit, on June 16 and September 15, 1868. This car had an air space for insulation entirely around the top, floor, sides and ends. To assist this insulating effect, there was placed two layers of hair insulation against the inner air space wall, and this was covered with an interior wooden shell. The ice tanks were placed along the sides of the car, and extended from the top of the car to within three inches of the floor. They were 4.5 inches wide at the top and tapered to two inches wide at the bottom. They communicated at the top with funnel openings, and at the bottom drip pipes carried away the water resulting from melted ice. Through the funnel openings on top were put in broken ice and salt. Many patents for supposed improvements to the refrigerator car were granted immediately after the foregoing; most of them so complicated as to prohibit their use, hence of no importance to the present discussion. The device of having V-shaped ice receptacles mentioned above in Davis’ car was altered by Tunstall of St. Louis, September, 1872, so that one V-shaped receptacle ran through the center of the car from end to end. This was filled at the top and had vertical drips at each end. Some of the patents issued in this earlier period are of great interest as curiosities, some of the cars being of the most complicated construction. One in particular has a zig-zag system of terra cotta or tile pipes running through the roof, walls, and floor of the car. These pipes were embedded in a layer of clay located between the outer shell of boards and the inner lining. Through the pipes water was to be circulated. Between the pipes and the interior of the car a thick layer of charcoal was to be packed in an additional lining, this charcoal to take up the unpleasant odors from the goods in transit. Then besides the layer of charcoal a layer of saw-dust in another additional lining was to take up the dampness and protect the interior of the car from moisture. Several of the patents contemplated the use of so much machinery that a practical railroad man would be extremely puzzled to ascertain where the designer intended to carry his cargo. The Michigan State Quarter Coin shows with an image of men putting ice in a refrigerator car, circa 1939.